This all started back just before Thanksgiving, when Elyse took it upon herself to launch an awareness campaign about a PSA being paid for by SafeMINDS, an anti-vaccine organization. The PSA was billed as informing people about thimerosal in flu shots and that pregnant women and new parents should opt for the thimerosal-free version for themselves and/or their newborn. SafeMINDS had paid to have this shown at a bunch of movie theatres over the Thanksgiving weekend. Now, the way it was billed, it sounds like a reasonable and unobjectionable thing, right? Well, the problem is that the PSA was more of a disservice announcement. It contained a number of factual errors about thimerosal, as well as emotionally charged imagery aimed at scaring people away from the flu vaccine (e.g., a syringe surrounded by puddles of elemental mercury). It made claims like the flu vaccine not being able to be disposed of in a landfill because it contains mercury, but that the government thinks it is okay for pregnant women. In reality, flu vaccines cannot be disposed of in a landfill because they are medical waste, just like used bandages, tongue depressors, saline solution, needles, other drugs and so forth also cannot be disposed of by a health provider in a regular landfill and instead require special handling. Put simply, the PSA was merely meant to instill fear in its viewers...fear of the flu vaccine, fear of thimerosal and, to some degree, fear of vaccines in general. SafeMINDS paid to have this ad shown in quite a number of places, from Boston all the way to California. That latter one is a bit of a head scratcher, by the way, since California state law prohibits administration of a thimerosal-containing vaccine to pregnant women or children under 3. So, why "educate" pregnant women and parents of infants in that state? Seems a waste of money, no? At any rate, Elyse put up a post on the Skepchick blog asking readers to write to AMC (one of the theatre chains that was supposed to run the ad) and other theatres and ask them not to run it. She also sent the message out over Twitter, having the message picked up by other skeptics, like Phil Plait and PZ Myers, both of whom have huge followings. Well, the campaign worked. AMC refused to run the PSA. Remember those links I had at the beginning of this post? A couple of them talk about Age of Autism's commenting policy. One would think that this comment would be against their policies. In fact, there was one person that commented on the FB page criticizing the AoA supporters for their crassness. 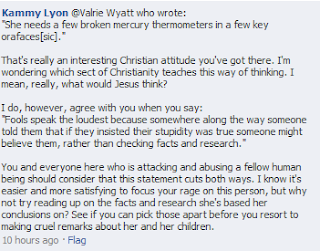 (Curiously, that poster, Juha, had her comments removed.) What is the response from the editors? So, not only is it just "gallows humor," we also have a tu quoque argument. I can't recall ever seeing the same level of vitriol, threats and dehumanization aimed at a member of AoA's community. 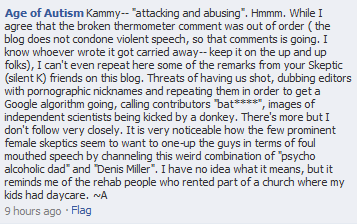 Name-calling, certainly, but threats of physical violence? Luckily, though, the editor that posted this comment said they would take the thermometer comment down. When I started writing this entry, the comment was still up, a full 7 hours after the editor made that promise. Checking again, just now, it appears that they have followed through, but I wonder if they would have removed it if no one had complained. There are still plenty of comments, though, suggesting that Elyse looks "mental", "disturbed", calls for DSS to step in because "this woman is sick" and so on. This behavior is reprehensible. I can understand being upset and disagreeing with someone. But address what they say. Do not make threats against them personally and definitely do not drag their children into it (e.g., by posting a picture of the target's child). 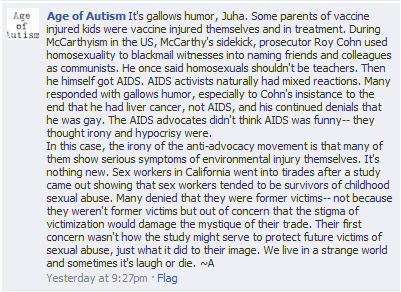 Yet another example of the vileness at the heart of the anti-vaccine movement. This is what those of us who support vaccination face. Elyse has a lot of courage to stand up against this kind of behavior, knowing what will happen if she strikes a nerve, knowing that she may need to seek help from the police to protect herself and her family. 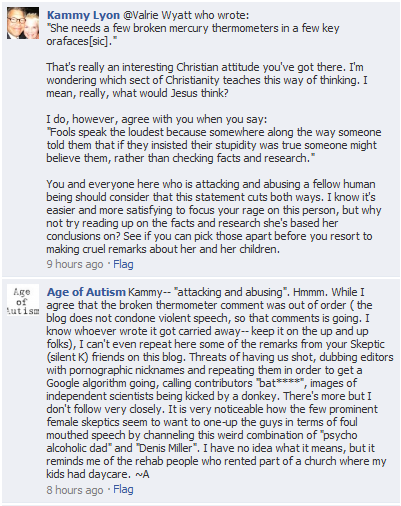 Update: The thread on Age of Autism's Facebook page has been pulled. At this time, it is unclear whether Facebook removed it or if it was removed by Age of Autism. There is a mistake on the fourth paragraph of this blog. Expired vaccines containing thimerosal are classified as hazardous waste. Expired vaccines that are NOT preserved with thimerosal are considered medical waste. Please see below and please fix this mistake in your post. Waste influenza vaccines are considered to be hazardous wastes if they contain mercury (such as thimerosal) or cresol-based preservatives. These are most commonly found in multi-dose vials, but also occur in some pre-filled syringes. Any multi-dose vial or pre-filled syringe that is not empty1 and contains vaccine with a mercury or cresol-based preservative must be managed as hazardous waste as explained in the “Evaluating Wastes in the Health Care Setting” compliance bulletin (http://www.cdphe.state.co.us/hm/pharmwaste.pdf). Other vaccines may also contain these preservatives and thus need to be managed as hazardous wastes. For more information about vaccines that contain thimerosal, please visit www.vaccinesafety.edu/thi-table.htm. Most single-use vaccine vials and single-dose pre-filled syringes (excluding Novartis syringes) are preservative-free vaccines. Preservative-free influenza vaccines are not regulated as hazardous waste when disposed. Thank you for the link to the Colorado Dept. of Public Health. An amendment has been added to the post. The SMART thing to do would be to let them hang themselves, and use your energy at presenting the FACTS and EVIDENCE instead of using general terms like "numerous studies proove" or "the questions have been asked and answered long ago"...language like this is for people who you think will just fall for this silly game of 'telephone'...because 'they' said so..who is 'they'? and exactly WHAT studies, WHERE/WHEN?!?! Think about it. Do something better with your time and energy and actually research and educate yourself, and then, and only then, should you state with exact references and exact links with specifics exactly WHAT and WHY someone you dont agree with is presenting something factually incorrect...and ifs a matter of opinion on where you differ, then its up to you to EDUCATE yourself with THE other SIDE's resources and links, and to UNDERSTAND their point of view...and THEN you have the right to present your specific information, specific sources, links/references and compare them side by side with the 'other sides' information/references/sources, and then you can gain the respect of ANY reader, regardless of that readers own opinion...and by doing it this way, not only will you gain respect, you will be able to ACTUALLY EDUCATE others with REAL information for others to join in your opinion or to share maybe further information to help educate you in return! Its amazing what happens when people start respecting eachothers OPINIONS and views, and actually having HEALTHY DEBATES. Have you ever tried researching and debating the exact opposite of your true opinion...if not, you should try it, its the adult thing to do. I might not agree with everything that Age of Autism presents, but at the very least I have consistantly been able to read and research their side of the opinions because they DO put the proof in the pudding..they DO present factual statements with links to sources/exact references, and THAT is respectable. I am sorry to say I can NOT say that about any of the bloggers/sites that consider themselves to be 'science' bloggers or 'professionals'. 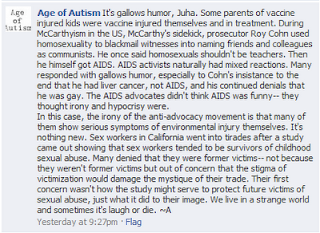 Its a shame because SO MUCH progress could be made within and outside of the Autism Community...a true shame. If this person didnt agree with the advertisement that Safe Minds paid for, then instead of initiating a name calling/drama blogging event to lure people into posting/into name calling/etc (I am NOT agreeing with ANY name calling/belittling at all ..AT ALL! )...but it was a PAID advertisement, and you know what, its an INDIVIDUAL choice for vaccination. And its not like anyone viewing the advertisement would be hurt by seeing it, it would simply just help initiate that person to ASK QUESTIONS at their doctors office, to AT LEAST inform patients that they DO have options to 'brands'/'types' of vaccines, there is NOTHING wrong with that. I an guarantee you that NOT ONE PERSON watching that paid advertisement is going to say 'oh no, thats it I am not getting it AND i am not saying anything to my doctor about it, andif I am pregnant, I am not going to get it'...but yet, of course they will be going to another appointment with their OB if pregnant, so at the VERY least that person would say 'I saw this ad that said this...or that...and I have some questions'....plain and simple, WHAT IS WRONG WITH THAT? Whether you agree or do not agree with the organization Safe Minds, has nothing to do with it...or if you agree/dont agree with the flu vaccine/toxins/etc...doesnt matter...IF the pharaceutical companies can have paid advertisements for Viagra during a Nick JR show, then I certainly do not care if there is a paid advertisement that focuses on patients being encouraged to communicate and ask their doctors questions...its SO MUCH BETTER than the countless pharma drug ads on tv/magazines/etc..because they are NOT promoting a product, or showing it in a great light with no 'problems', smiling people running thru the dandelions advertising some new pharma drug....its a paid advertisement encouraging patients to ask more questions, to konw that there ARE options, to encourage more people to ASK questions and RESEARCH ALL of their options. If there is nothing to 'hide' about something, then why HOLD back ANY information, ANY choice, ANYTHING? Getting past the random use of all caps, did you actually read my post? Did I call for Age of Autism to get shut down? Nope. The folks at AoA have a right to say what they wish. Those who disagree with them also have the right to say whatever they wish, including the right to criticize AoA. As far as the movie ad went, they can certainly pay for whatever they want. Likewise, the theatre companies can decide whether or not they wish to transact with AoA. Regarding doing research, well, I have done some. I've read stuff that AoA puts out, and I've gone to original source to see if what they say is accurate. Many times, it isn't. You can find some examples that I've pointed out on this site, with links to back up what I say. The impression I get from a lot of the regulars at AoA is that they get all they need to know from AoA and similar sites, in all its factually erroneous glory. Here's the thing. AoA puts out factually incorrect information. They also censor dissenting comments. They do not follow their own commenting rules. They do not provide autism news except where it involves either vaccines (and even some articles about vaccines that do not even mention autism) or some violent or negative news about autism. I'm all for people making decisions for themselves. However, in order for them to make proper decisions, they need accurate information. They don't get that from AoA.